A pseudo-“Conconi test” to predict the anaerobic threshold. 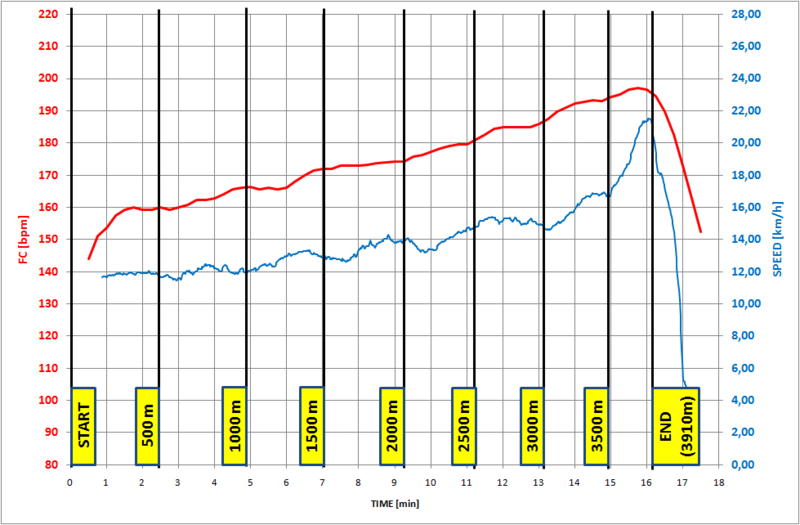 The “Conconi test” is a noninvasive field test to determine the anaerobic threshold, based on an observed deviation from the linear heart rate (here FC) vs. running speed (RS) curve at high RS. The title of this article reports a “pseudo” before “Conconi test” because the protocol suggested by Conconi et al. (“The Conconi test: methodology after 12 years of application” – Centro Studi Biomedici Applicati allo Sport, Università degli Studi di Ferrara, Italy – Oct. 1996) is slightly different, but the main attempt is just to describe a method that can be used by any runner that owns a Heart Rate Monitor, a Chrono and a measured stretch of road. At the end of the test two types of graphs can be plotted: the first one represents the FC vs. time and the RS vs. time together, as shown below. 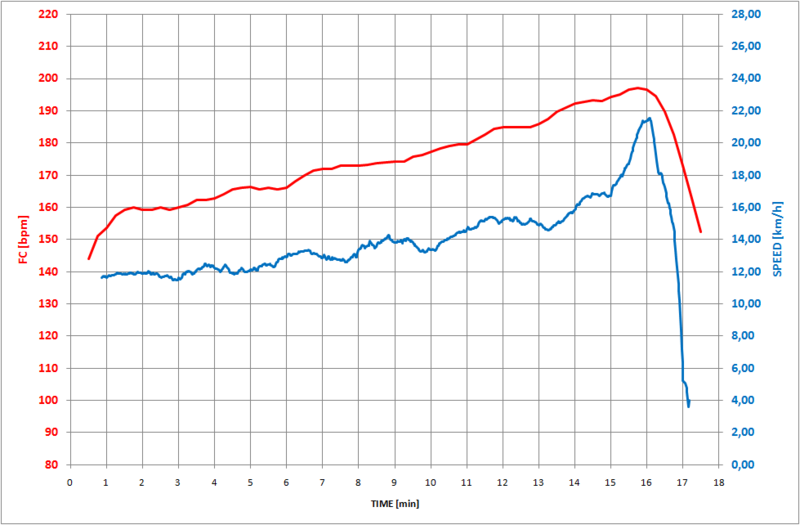 FC and speed vs. time. The detail of the previous plot is shown in the next figure, where the distance references are highlighted. FC and speed vs. time: detail. 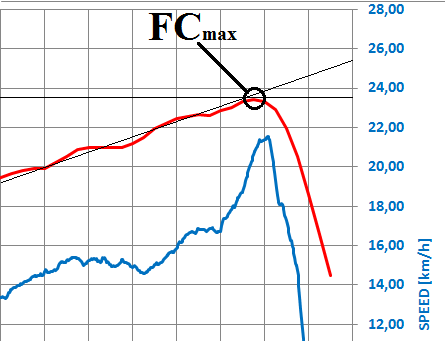 Zooming on the top of the red curve (FC), the FCmax can be easily read. But the most important graph is the following. 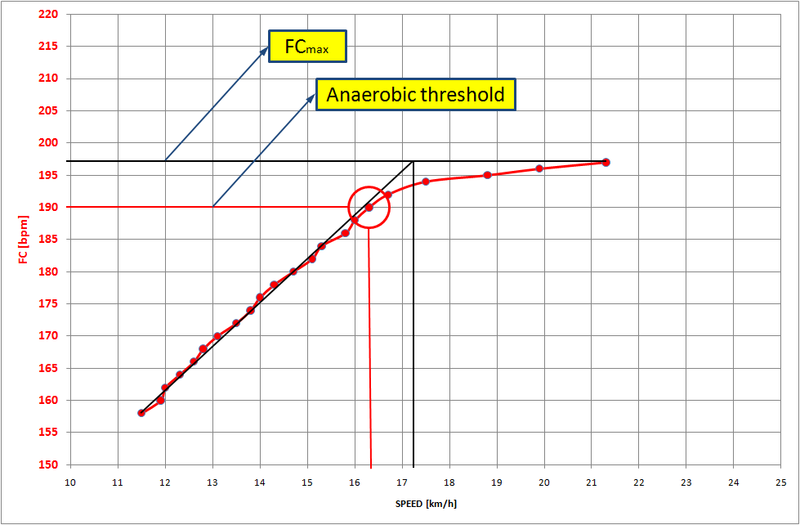 Plotting FC vs. RS the anaerobic threshold can be determined finding the deflection point, where there is a deviation from the linear FC vs. RS curve. The meaning of this knee is simple: when linearity stops, the accumulation of lacitc acid (LA) starts. The higher the threshold, the higher the RS without accumulation of LA. Thus you can find the anaerobic threshold for FC (AFC – Anaerobic Heart Rate) and for the speed (ARS – Anaerobic Running Speed). Graphic method to determine the anaerobic threshold. The accuracy of this method, anyway, is strictly connected with the accuracies of the instruments employed and with the human and environmental boundary conditions. Anyway, this is for sure a good tool to understand the orders of magnitude of the variables used. As Claude Rouelle taught me: “Is it going to be accurate? No. Is it going to be useful? Yes!”.